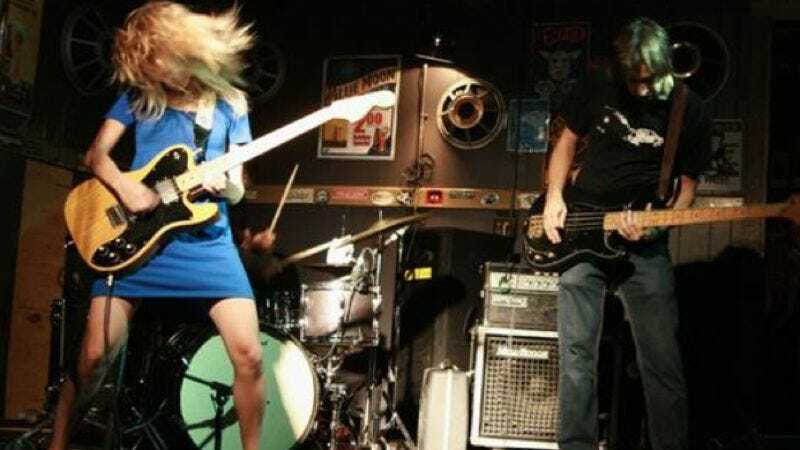 Having accumulated near-unanimous accolades on the blog circuit, including a few breathless comparisons to late-'80s/early-'90s rock godheads Nirvana and Sonic Youth, Austin power trio Ume seem poised on the brink of some serious attention. Led by deceptively waifish singer-guitarist Lauren Langner-Larson, Ume (pronounced “oo-may”) traffics in unselfconsciously anthemic rock 'n' roll fueled by Larson’s slashing, expressive guitar style. Aided and abetted by a brutally precise rhythm section composed of bassist Eric Larson (Lauren’s husband) and drummer Jeff Barrera, whose primal urgency lends the tunes a metallic heft, Langner-Larson’s riffage evokes the focused squall of first-wave alternative, balancing serious chops with focused, tasteful playing. The full breadth of the band’s sound isn’t really that sound-biteable at all: Ume’s self-released EP, Sunshower, channels the cavernous production of classic rock—the EP was tracked to a vintage tape machine by go-to Austin producer Frenchie Smith—but to distinctively post-modern ends, with elements as extreme and diverse as sludge-metal, dream-pop, and avant-noise constantly roiling just below the record’s glossy surface. Before the band plays Kung Fu Necktie tonight, The A.V. Club had a few quick words with Langer-Larson and Barrera about grindcore, grinding out Sunshower, and grassroots band promotion. The A.V. Club: The new EP has a '90s feel. Do you feel a kinship with that era? Lauren Langner-Larson: I always think it’s kind of funny, because we're never thinking “’90s." One thing that might be similar is the philosophy behind what we’re trying to do. I’m always like, “Let’s try to make songs that we’re really putting everything into. Really push this part to a limit, yet still have a lot of pop elements." It’s more our approach to writing songs than any conscious thing. For some reason I guess that comes across as '90s. [Laughs.] It could be because we’re really trying to rock out, and maybe it isn’t cool to do that anymore. But we’ve all been rocking since the '90s, so we can’t really stop now. AVC: What sort of bands were you “rocking” in back then? Jeff Barrera: 1996, I think, is when I was in [Houston's] Race Car Riot. That lasted three years, maybe. LL: When I was 15 I played in a grindcore band called Twelve Blades. That’s how I met Eric. Those are actually more our influences, which most people don’t really pick up on. AVC: How was it recording with Frenchie Smith? Was it his idea to make you record to tape? LL: Yep. We had done some demo work with Mike McCarthy [Trail Of Dead, Spoon], but he just wasn’t going to work out for this [record], so he recommended Frenchie, whom we’d heard a lot of great things about. And working with him was awesome.